President Donald Trump speaks to members of the media on the South Lawn of the White House in Washington, before boarding Marine One helicopter, April 10, 2019. FILE - Democratic presidential candidate Sen. Barack Obama, D-Ill., and Republican presidential candidate Sen. John McCain, R-Ariz., talk during the presidential debate Wednesday, Oct. 15, 2008, at Hofstra University in Hempstead, N.Y.
Gregory and his Kent State colleague Will Kalhoff observed a "recency effect," in which potential voters take away more of an impression from the end of debates. 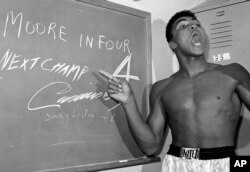 FILE - Young heavyweight boxer Cassius Clay, who later changed his name to Muhammed Ali, points to a sign he wrote on a chalk board in his dressing room before his fight against Archie Moore in Los Angeles, in this Nov. 15, 1962 file photo. 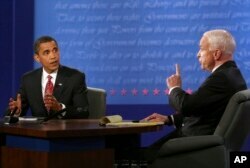 Obama had a "rope-a-dope" debating style akin to the boxing techniques of heavyweight legend Muhammed Ali who would hang back from the start of a fight until his opponent exhausted himself and then dominate the end of the match, according to Gregory who concluded the victorious candidate is the one who sets the tone, so to speak. 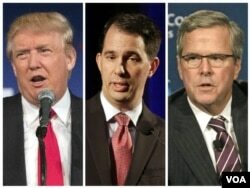 FILE - From left, 2016 Republican presidential candidates Donald Trump, Wisconsin Governor Scott Walker and former Florida Governor Jeb Bush. “I'm skeptical as a practitioner of anytime someone comes and says, ‘We have isolated the thing that impacts the results of a campaign’— whether it's yard signs, TV ads, money in politics or how someone talks,” says Matt Dole, who has worked on about 250 local and state campaigns of Republican candidates in Ohio. “I don't think Trump is a good case study in the pitch of the voice mattering,” he says, arguing that when it comes to the current president “it’s more cadence,” pointing to Trump’s ability to hold an audience with extemporaneous remarks at big rallies.